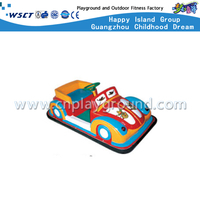 You are here: Home » Blog » PRODUCTS NEWS » How Do Bumper Cars Work? How do bumper cars work? It is a good question. 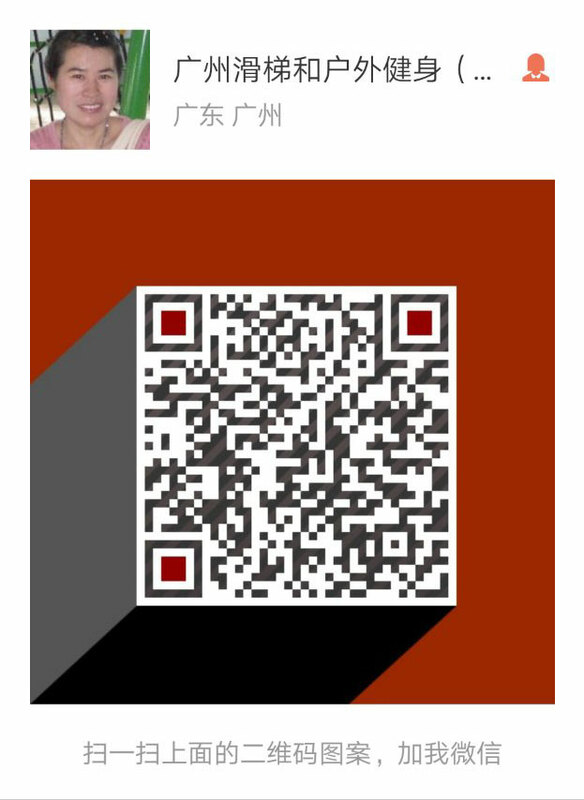 And now, we should know what it is included. 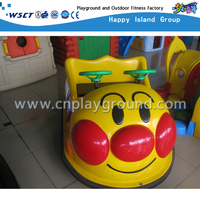 Bumper car is consisting of electricity, bumper, seat belt and driver. 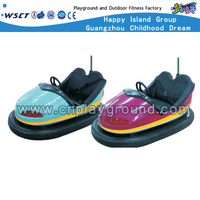 Bumper cars rely on electricity to run, which may be pulled from an overhead power supply or from built-in, rechargeable gel cell batteries. 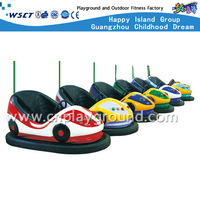 In an overhead power configuration, electricity transfers from the overhead power to the bumper car’s electric motor through a tall pole mounted on the rear of the bumper car; by contrast, gel cell battery-driven bumper cars rely on built-in batteries that can be recharged at the end of the day or between uses. 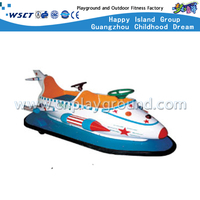 Like road-going cars, bumper cars ride on three or four wheels mounted on the car’s bottom, and at least two of the wheels provide drive power when the operator activates the motor by pressing the pedal; in some models, turning the steering wheel to its full extension or activating a lever mounted inside the car reverses the polarity of the electricity fed to the drive motor to provide reverse acceleration and allow the car to back up. 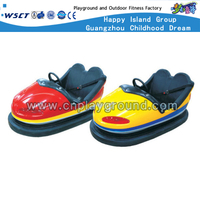 The objective of the children bumper car ride at most amusement parks is to bump into other bumper cars. To prevent damage and protect the bumper car drivers, manufacturers pad the outside of bumper car frames with large rubber bumpers; according to Amusement Park Physics, a service of Annenberg Media, these large bumpers diffuse the force of the impact to transfer only minimal shock to the car and its occupants. The size of bumper car arenas and the design of the cars themselves limit the speed at which the cars can travel to keep their inertia low. 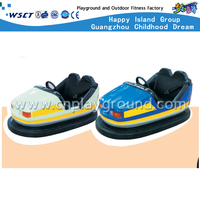 When two bumper cars collide, the large bumpers absorb the force but allow the occupants to feel an inertial change; this sudden jolt provides a safe thrill for the bumper car driver and passenger. Because of the sudden and frequent jolts, amusement park managers typically require bumper car riders to wear seat belts. Instead of the standard three-point seat belts found in road cars, bumper car manufacturers typically install five-point safety harnesses similar to those found in professional race cars. 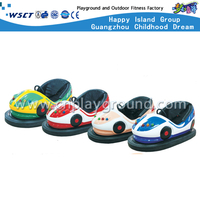 These padded safety belts restrain the driver to prevent sudden inertial changes from ejecting him onto the bumper car arena and further absorb the shock of sudden direction changes. As electricity feeds the motor that propels the bumper car forward or backward, the driver must maintain some measure of control over the vehicle’s direction. 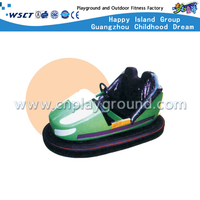 To accomplish this task, bumper car manufacturers equip each car with at least one steering wheel. 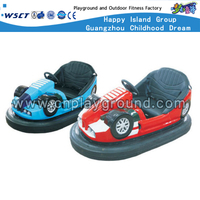 Because bumper cars do not require advanced steering features commonly found on road cars, manufacturers connect the steering wheel directly to the one or two directional wheels mounted under the car. When the driver turns the steering wheel, a connecting rod positions the directional wheels at an angle that allows the car to turn when the driver applies forward or reverse power. 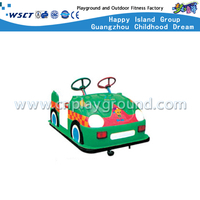 Depending on the model of bumper car equipment, the car may rely on two directional wheels mounted on either side of the car’s underside, or a single directional wheel mounted, like a tricycle, in the center of the car's bottom.